A token amount of plot: Nina (Natalie Portman) has recently been chosen as 'prima ballerina' for her New York ballet company, replacing the recently retired Beth Macintrye (Winona Ryder). The first show up for the season is a stripped-down and emotionally raw retelling of Swan Lake, and although artistic director Thomas Leroy (Vincent Cassel) is completely confident in Nina's abilities to handle the 'white swan', Nina finds herself unable to channel the darkness and sensuality found in the 'black swan' character. As Nina struggles to satisfy her demanding and mentally taxing instructor, she finds herself at odds with her mother (Barbara Hershey) and confused about the intentions of the troupe's newest dancer, Lily, who may or may not be gunning for the top slot. But is Nina's greatest threat external or internal? First and foremost, Natalie Portman delivers a truly defining performance. It's a brave and passionately committed piece of acting, with a character that is in nearly every frame of the picture. Portman's talent has never been in question, but this is a shattering 'leave nothing on the table' star turn. This is not a film full of monologues or big speeches, but Portman sells a most complicated leading lady with a dynamic physical presence that none-the-less is completely at the service of the film. 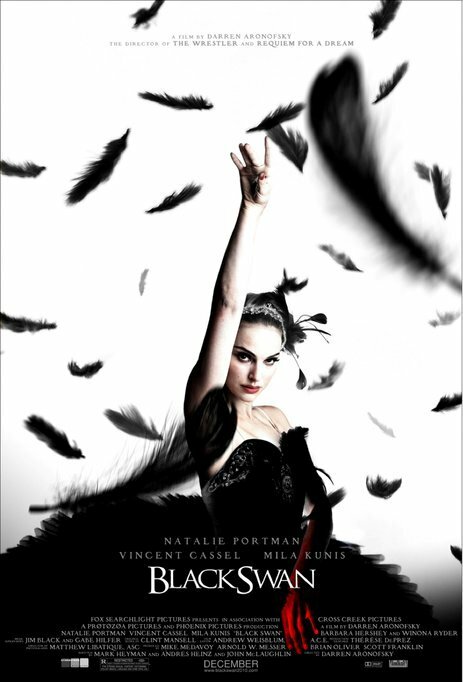 But Black Swan has more to offer than just Portman. What's most refreshing about the film is the refusal to stereotype characters that could easily be played to a type. Vincent Cassel does subtle work as his ballet director never quite lets on just what his relationship is with his prize pupils. Oh, we might assume that he has a carnal eye, but everything he does is seemingly about pulling out the best performance possible from his pupils. Mila Kunis, in a rare purely dramatic turn, does solid work as someone who stands out from the pack by refusing to commit every fiber of her being to dancing. While the story could have gone the All About Eve/Showgirls route, we soon realize that Lily genuinely just wants to be friends with Nina. If she leads Nina into a reckless situation or two, it's only from a desire to show Nina how to live a bit outside the dance studio (to answer your question, yes they do, it's about 2/3 of the way through the film and it's quite explicit). Of course, certain moments are open to interpretation, but it is refreshing to see a film centered around females where all of the women aren't constantly at each other's throats. On the other side of the spectrum is Winona Ryder's enraged, if brief, performance as the seemingly scorned woman. We presume that Leroy was engaged in an affair with the once prima ballerina and then discarded her when she got too old, but there is no evidence to support that aside from our own preconceptions. Nina's mother too appears to be a standard dominating stage mother, but Barbara Hershey instead plays a woman who genuinely supports her daughter's ambitions, perhaps to a fault. The surprisingly complicated characters lend a quirk to the dark and claustrophobic story being told. This is a fiercely intimate drama, with few scenes leaving the ballet studio or Nina's cramped apartment. The film is almost leisurely paced, but we constantly get subtle signals that something beyond our understanding is afoot. There is an air of menace and malevolence lurking in every scene, so when the film truly ramps up the tension in the third act, it's almost a relief from the anticipation. What transpires in that third act I wouldn't dream of revealing, but the film becomes a feverish rush of high emotion and genuine dread. It doesn't quite reach the rush of the Requiem for a Dream, but it's not for lack of trying. When it's trying to be, Black Swan is a surprisingly scary film. If Black Swan has a flaw, it is that it is not as emotionally engaging as Darren Aronofsky's prior works. It lacks the open-ended despair of above-noted Requiem for a Dream, the heart-ripping grief of The Fountain, or the sorrowful mourning of The Wrestler. Black Swan, while visually dazzling and brilliantly staged and acted, is more of a technical exercise than an open-hearted tale of doom. On the other hand, it won't leave you drained either. Nonetheless, it is a truly impressive motion picture, with stunningly good performances and difficult-to-label characters. So if Black Swan is not Aronofsky's best work (Requiem is probably one of the best films of the last decade), it is more artistically inspired than the somewhat contrived The Wrestler and more coherent than the comprised The Fountain. It is another sign that Aronofsky is one of this generation's most potent cinematic artists. In more ways than one, Black Swan is a hell of a movie.